After deciding to go it alone with 5G, Verizon has sought to boost its LTE network in the short term by launching what appears to be America’s first LTE-A service using three carrier aggregation. The American telco giant has announced its LTE-A offering will be using three channel carrier aggregation to achieve “peak” speeds of 300 Mbps. It says 700 MHz, AWS and PCS spectrum channels will form the core of its LTE-A proposition, and chief wireless network engineer Nicki Palmer used a handy motorway analogy to explain what carrier aggregation and LTE-A really means for users. Verizon claims its users will now benefit from 50% faster peak speeds, but didn’t go so far as to say outright that it’s the first American telco to launch three carrier aggregation. Not wanting to miss out on the act, challenger mobile player Sprint said it too has been trialling three channel carrier aggregation over the past few months and claimed its trials over the weekend with Samsung demoed download speeds of 230 Mbps. AT&T meanwhile was apparently the first US telco to launch LTE-A, using two channel carrier aggregation back in 2014 first launched on the Samsung Galaxy S5. T-Mobile is said to be trialling three carrier aggregation, but is yet to confirm its launch. Sprint also pointed out that it launched two channel carrier aggregation back in November 2015. Sprint seems to be making a point of keeping itself relevant after competitor announcements, after promptly announcing its unlimited data plans within hours of T-Mobile doing so. After the launch of each bundle, Sprint CEO Marcelo Claure claimed T-Mobile saw its plans to launch a bottomless data plans and rushed its go-to-market strategy. 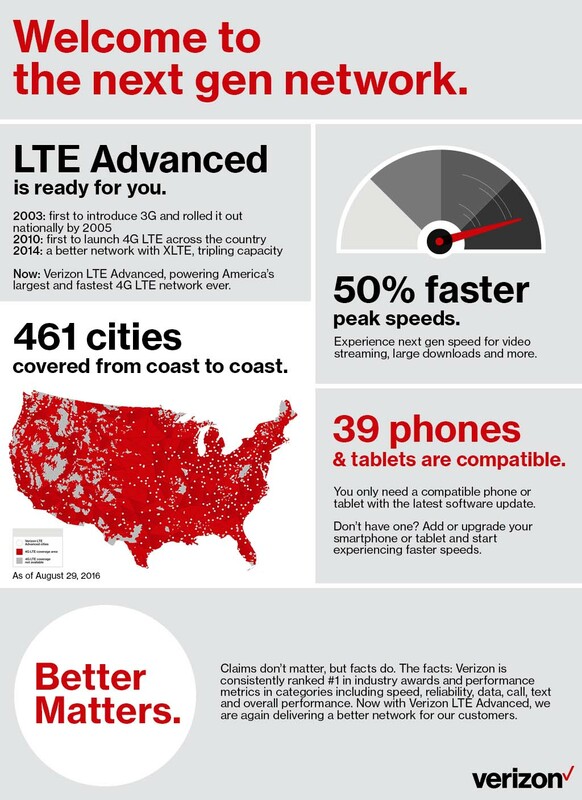 In all, Verizon says it will be bringing substantially faster wireless data speeds to more than 288 million people in 461 cities, launching immediately on 39 handsets which simply require a software update. Here’s a handy infographic it sent with some stats about the launch. For more on this story, see this Light Reading article.